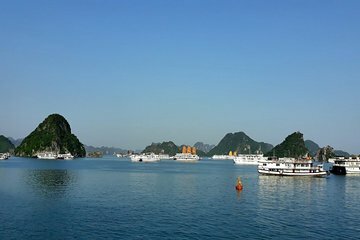 Ha Long Bay is known for its stunning limestone mountains, beautiful beaches and overnight cruises, but it can be hard to justify if you’re on a tight travel schedule. Justify it with this convenient day trip from Hanoi. All transport is organized, from your early morning pick-up at your Old Quarter hotel to your evening return. Cruise around Ha Long Bay on a traditional wooden junk, take a kayak or bamboo boat around the floating village of Ba Hang, and go spelunking through the otherworldly grottoes of Thien Cung and Dau Go.